Sadly, life/career is taking over, and I will not update the maps until at least mid-February. I wish you all a great 2011! These ranges are symmetric with respect to Obama's national margin of victory in 2008, 7.25%. The only adjustment was for Arizona, to remove the McCain home state effect. Obviously, the GOP may receive a boost in other states once their ticket is set. The light blue states the Democrats are probably most worried about are Wisconsin (smallest margin among those states in 2008) and Michigan (due to the economic situation there). As for the Republicans, the most vulnerable red state is probably North Carolina, which Obama carried. Obama also carried Indiana, but he will have a hard time in the rust belt this time. Assuming all colored states go to the favored party (otherwise, it's probably a blowout), the electoral count is 217-206 for Obama. He therefore needs 53 of the 115 remaining EVs. 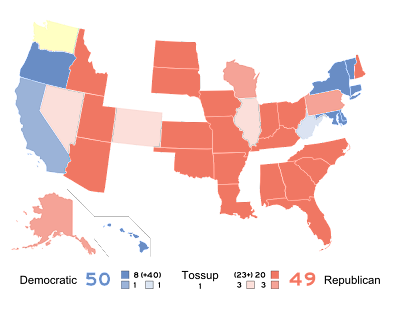 The Democratic senate successes in NV and CO and their gubernatorial win in MN this fall are encouraging for the White House; that's 25 EVs. 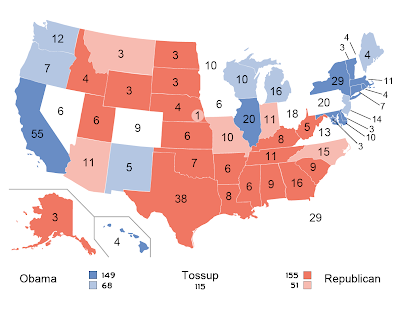 On the flip side, I would be quite pessimistic about OH (rust belt) and FL (a mere 2.8% win in 2008). The remaining four states, PA, NH, VA and IA and their 43 EVs would probably be the toughest to call in a close national race. Obama needs PA and either VA or both NH and IA. He will need to activate his networks in NH and IA without the help of a primary race, and might want to make frequent trips across the Potomac while Republican hopefuls go at each other during the coming year. Here's the evolution of seat projections over this blog's 17-month-or-so existence. Below is a summary of the year from the perspective of each of the major parties. Conservative Party: Before prorogation, the end of 2009 was a sweet one for the Tories. Although they weren't in majority territory, they were very close and slightly above their 2008 election results. On December 30, however, Stephen Harper announced that Parliament would be prorogued until early March, and what political observers would have asked were they not on vacation is whether this second prorogation would dent the Conservatives' popularity. Well, the answer came quickly in the new year, as polls immediately pointed to a tight race between the Tories and the Grits. What had been a 70+ seat lead quickly shrank to a 20-seat edge, and some polls even put the Liberals marginally ahead. The Conservatives recovered somewhat during the Olympics, and were then flat flat flat for nine months in the low 130s - perhaps fittingly given the lack of big news on the federal scene. However, the last month of the year saw, for reasons that are somewhat murky, a further recovery in Tory fortunes, and Harper ends the year only marginally behind where he was a year ago. Liberal Party: The furor over prorogation obviously benefited the Liberals at the start of the year, and as the Tories partially recovered during the Games, the Grits gave back some of their gains. However, through the spring, even as the Conservatives were going nowhere, the Liberals kept sliding slowly, but surely. By mid-year, the Grits had coughed up almost all of their prorogation gains. The summer, however, reversed that trend, and by Labor Day, fresh from his BBQ tour, Ignatieff was just short of where he was during the prorogation episode. 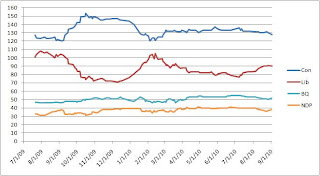 Unfortunately for the Liberals, as temperatures cooled, so did Canadians' sentiment toward their leader, and they end the year on a low, still ahead, but only marginally, of where they were in late 2009. Bloc: The Bloc dipped a little early in 2010 due to the Liberals' strength. But as the Liberals slid during the spring, the Bloc recovered and even gained ground, staying above 50 seats for the most part through the rest of the year. 2010 was smooth sailing for Duceppe, as he had no real competition in Québec, and the situation seems unlikely to change any time soon. NDP: For most of the year, the NDP's fortunes were inversely related to the Liberals'. During the good Grit stretches, the Dippers were in the low to mid 30s, while during Grit skids, the NDP hovered around 40. However, the late-year Tory surge has hurt Layton even as it weakened Ignatieff. Is this a temporary blip, or the beginning of the end of Layton's leadership? EKOS decided not to wait until next week to give us its last poll of the year, which may also be the last voting intention poll overall for 2010. There is not too much of note in this poll. Overall, the NDP and the Bloc were somewhat stronger than usual, and the two main parties a bit weaker, but these changes are not statistically significant, and there are no surprising regional numbers, except perhaps that the Liberals are just 20 points behind the Tories in Alberta. The average Tory national lead is 7.5% (due to rounding) 7.4% (Harris-Decima has posted its latest poll report, which allowed me to get unpublished numbers from previous weeks), almost unchanged. Given that this is most likely the last poll of the year, I will, over the next few days, post updated graphs and maps. But you can already imagine that these updates won't be too exciting: all parties are within 5 seats of their count in the last projection of 2009. Indeed, after all the ups and downs of 2010, the end changes are rather puny: the Tories lost 2, the Grits gained 4, the Bloc gained 3, and the Dippers lost 5. The latest poll from Harris-Decima, unlike other recent ones, have the Grits and Tories in a statistical dead heat. Ontario is tied in this survey, while the Tories have low numbers (relative to other polls) in BC, Alberta and Québec. The Bloc, at 44% in Québec, is strong, though this is often the case in Harris-Decima polls. The same goes for the Greens at 21% in BC. This is a fairly weak poll across the board for the NDP, except in Alberta, where 14% is quite good for the Dippers. There has also been a Léger poll with weak Bloc and strong NDP numbers. Both Léger and CROP have been consistently delivering better results for the NDP in Québec than national pollsters. Any idea why? The average popular vote lead for the Conservatives drops to a still sizable 7.4%. Unless infrequent pollsters like Environics and CROP come out with new numbers soon, there may only be no more than one voting intention poll left this year: hopefully EKOS will release bi-weekly numbers next week. Shortly after that release, I will update the projection graph and hopefully also the maps. Update: I just noticed that I missed a CROP poll that came out two weeks ago. Incorporating it into the average does not change the projections. So indeed, virtually all pollsters have said their final word of the year on voting intentions! The most recent Ipsos poll was released on Friday, and confirms what all pollsters but EKOS showed: an increased Conservative lead. 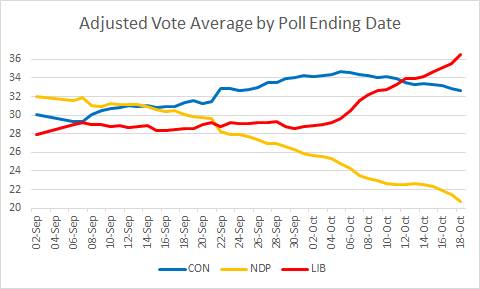 It also has the weak NDP numbers that EKOS, but not the other pollsters, picked up. The average Tory lead over the Grits increases to 8.4%. Unlike the three polls earlier this week showing the Conservatives at 35-38% and with a near 10-point lead, EKOS' latest numbers suggest that the situation has remained fairly stable, as they only spot the Tories a 5-point lead. According to EKOS, Ontario is still a tie, and the Liberals lead by a whopping 38 points in Atlantic Canada (as always, small sample alert), contrary to the other polls that have the Tories ahead in both regions. However, EKOS confirms the Conservative strength in BC. On the face of it, the Liberals gained 3 seats from the NDP. Actually, only one seat was transferred in that way. In the East, the Liberals also had a net gain of 2 from the Tories, who took them from the NDP out West. The average Tory national lead is 8.1%. However, because the regional breakdown for the first week of polling was not released, the above projections do not take that week into account. Also omitting it for the popular vote gap calculation would put the Tory lead at 8.4%. After two bad polls for the Liberals yesterday, we get today an even worse one from Angus Reid! Once again, the Tories lead in Atlantic Canada, but what's really great for the government is that they lead by 13% in Ontario. If this were borne out in an election, the Grits could fall as low as 60 seats nationally, and the Tories would have a good shot at a majority. The average Conservative national lead is now 8.7%. They won the 2008 election by 11.4%, but are able to reach the same seat count since their popular vote losses are from the West, where most Conservative seats are safe anyway. The small seat losses there are offset by gains in Atlantic Canada, which is very competitive between the two main parties and therefore has a disproportionate share of swing seats. The most worrisome thing in all this for Ignatieff is that he didn't commit any major faux pas lately, and yet is back where he was last fall, after he foolishly announced he would defeat the government. The voters that the Liberals need to win an election may be harder to get back this time. 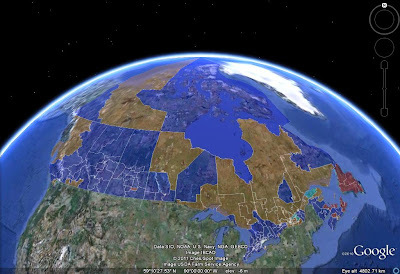 - the Tories stay strong in BC, while the Bloc shows no sign of dropping in Québec. - the Conservatives' gains in popular support were larger than the NDP's. The average national lead for the Tories jumps to 7.6%. The Canadian Press reports on the latest Harris-Decima poll, showing a narrowing gap between the Tories and Liberals. In Atlantic Canada, this poll agrees with the latest Ipsos, Angus Reid and Léger that the Grits have a double-digit lead; now only EKOS shows a tight race there. The Liberals must also be encouraged by their 28% number in Québec. However, Ontario is still a dead heat. The NDP got another really low number in Alberta (6%), but their 30% in BC might give the Dippers hope that they've recovered from weak August polling there. The average Conservative national lead is 4.9%. 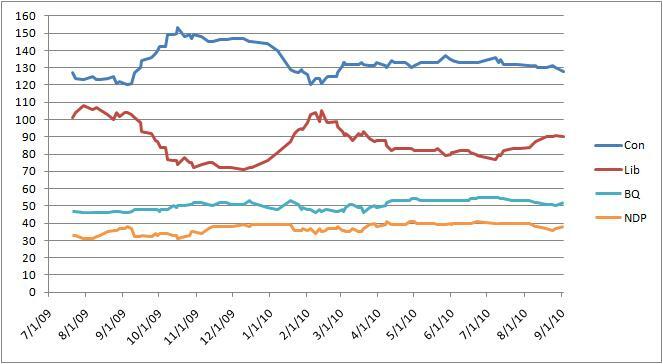 That Léger poll increasingly looks like an outlier. Excluding it would make the gap roughly 4%. Léger Marketing has posted not one, but two new polls this week. The older one is a national survey from early August, and it shows a much larger Conservative lead (9 points) than contemporaneous polls (3-6 points). This can almost entirely be explained by the 7-point Tory lead in Ontario (compared to 1-point in other polls at that time; the latest EKOS shows a 3-point Liberal lead there) and by a whopping 48% for the Conservatives in BC (against 19% only for both the Grits and the Dippers). The newer poll is a provincial one, and shows run of the mill numbers for Québec. Only the Tory number is slightly higher than usual - Québec pollsters often produce such results, in anticipation of the common federalist ballot box bonus. These polls do not cost the Liberals any seats in the projections, though it pushes them farther away from bigger gains in Ontario. The Tories do manage an extra seat at the expense of the NDP, which is now at its lowest level since mid-March. The average Conservative national lead is 5.5%, but expect this number to go back down as this poll may well be an outlier. As you may have noticed, I've created an "Economics" label so that you can find my posts on that topic more easily. I've also renamed the vague "Commentary" to "Opinion," and somewhat broadened the scope of that category. Please let me know if there are other tags that you would find helpful! 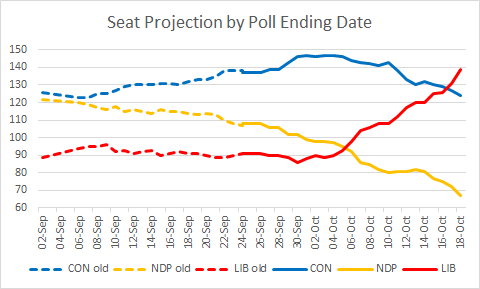 The newest EKOS poll suggests that things may have stabilized, with very similar national numbers for both weeks for the Grits and the Tories (the NDP did improve quite a bit on the Prairies and in the Atlantic provinces). The most intriguing development in this poll is the 3.3% Liberal lead in Ontario during the second week, a change from a roughly 1% Conservative lead during the first week and in previous polls. Are the Grits finally getting traction in that crucial battleground? Like in other recent polls, the Grits managed to score a respectable 25% in Québec, so their recovery from the spring doldrums there seems real. On the flip side, after several strong polls in MB/SK, the Grits fall back into the teens in this one, to the profit of the NDP. However, the Dippers did dismally in the other Prairie province, which (barely) moved my Alberta projection to a Tory sweep. In BC, this poll confirms the recently observed widening of the Conservative lead over the NDP; are British Columbians already calming down from their HST anger? The average Conservative national lead did grow slightly, however, to 4.7%, mostly on the much reduced weight of the 7/28-8/3 EKOS polling that had the Tories up by just 1.2%. How Rich Is Canada Relative to the U.S.? According to Statistics Canada, Canada's real GDP per capita is catching up to America's: it went from 82% in 1999 to 92% in 2008. However, according to the IMF, during the same period, it went from 81% to 82% (other international organizations, like the OECD and the World Bank, show similar numbers). What's going on? The reason why these estimates have come to differ so greatly is that Statistics Canada estimates that the purchasing power of each Canadian dollar was 90 U.S. cents in 2008, while the IMF reckoned that it was only 81 cents. In contrast, in 1999, both agencies pegged the CAD's real value at 0.84 USD. Of course, this begs the questions: why did the difference arise, and who's right? 1. The International Comparison Program (ICP) is the main reference for establishing the true purchasing power of various currencies. It does so by collecting prices for a variety of goods in each participating country. The last round of the ICP was carried out in 2005, and determined that the CAD's purchasing power was about 0.82-0.83 USD. However, Statistics Canada used extra data and recomputed the figure by tweaking the basket of goods being compared, so that it better reflects North American consumption and investment patterns. The adjusted value was 0.87 USD. - If one is trying to figure out economic (i.e. real GDP) growth for a given country, one should use production prices: the goal here is to compute the change in the volume of G&S produced. The relative prices of imports and exports are held constant. - If one is instead interested in international comparisons of material quality of life, the consumption prices are the relevant ones. The relative prices of imports and exports follow changes in the market. In Canada's case, this makes a big difference: as energy prices have risen considerably, a given volume of Canadian exports is now worth more imports than it used to. This has not been the case for the US. Thus, since 2005, while Canada's economic growth per person has roughly matched America's, Canadians' material quality of life has been increasingly more rapidly than Americans'. This is the second reason why international organizations, using the former measure, do not show Canada catching up, while Statistics Canada does. To make a long story short: there is good reason to believe Statistics Canada's findings that Canadian economic standards are catching up to American ones (although I'm bit skeptical about the point 1 adjustment being so large)! This is consistent with the mood in the two countries, even during the 2003-2007 expansion: while Canada and the U.S. posted similar growth rates (and had similar population growth rates as well), Canadians were much more upbeat than Americans about the economy. After the next round of the IPC in 2011, international organizations will recognize part of the catch-up (the portion related to point 2), as the exercise will update the relative prices of all goods. Interesting side note: although Statistics Canada puts the CAD's purchasing power at 0.90 USD, it is lower for private consumption goods and services (what you and I actually "feel") - only 0.84. The numbers vary wildly across categories of goods: food, alcohol and tobacco are a lot more expensive in Canada, while health care (even the private portion, like eye care and dentistry) and education are a lot cheaper. However, for government purchases and capital investments, the values are 1.01 and 0.98. The former reflects cheaper health care in Canada, while the latter may be partially due to Canada mainly using value-added taxes instead of sales taxes. A new Angus Reid poll is now available. It confirms the tightening of the race between the Grits and Tories, and provides reassurance to the NDP after two bad polls earlier this week. This poll has something for everyone. The Tories can be happy to still lead by 3% in all-important Ontario (and by 48% in Alberta). The Liberals can congratulate themselves over a whopping 47% lead in Atlantic Canada (with 65% of voting intentions! ), and yet another strong result in MB/SK (32%, just 10 behind the Tories). The NDP can get excited about their 18% in Québec, and relax a little about MB/SK and BC, where they get OK numbers (24% and 27%). The Tory average national lead is now at 4.4%. I'm already curious about what next week's EKOS will tell us - but that's a whole week from now! Will Nanos or Environics come save us? 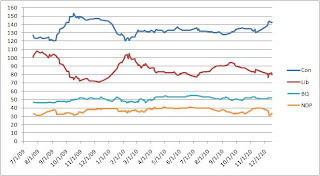 Another statistic of note in the recent poll: Harper has fallen below Ignatieff in terms of momentum, and how! 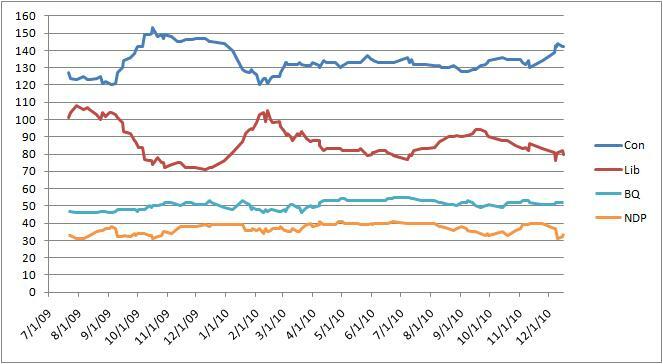 In previous Angus Reid polls, Ignatieff tended to have, by far, the worst momentum score. However, over the past month, Harper was at -26 (just 6% have a better opinion of him, 32% worse), while Ignatieff was at -12 (10-22). That BBQ tour has probably not generated much positive feeling for Ignatieff, but it can be argued that it has mitigated some negative ones. The census flap, however, has probably damaged Harper, though it remains to be seen whether the effect will last. Figures below refer to US median household income, in 2008 dollars, and come from the US Census Bureau. The truth, of course, is somewhere in the middle. Nixon/Ford were unlucky to face the Oil Crisis; the Fed's inflation fighting destroyed Carter's record and gave Reagan an artificially low base to start from; Bush Sr. had to raise taxes due to Reagan's deficits; Clinton probably benefited from Reagan deregulation; Bush Jr. cannot be held solely, or perhaps even mainly, responsible for the financial crisis, which had roots in the Reagan reforms and in the Fed's actions mitigating the bursting of the Clinton tech bubble. Given this history, you can be sure that 25 years from now, people will still be arguing whether the sluggishness of the current recovery is Bush Jr.'s or Obama's fault. ThreeHundredEight.com has reported on the latest Ipsos Reid poll, while Harris-Decima has its own new release. The two polls are not surprising and indeed virtually identical in Québec and Ontario: the Conservatives still lead by 1 in Ontario, while the Liberals seem to be on a slight up trend in Québec. Considering small sample sizes, Alberta and Atlantic results are also unsurprising. In Manitoba/Saskatchewan and BC however, the Liberals show unexpected strength in the Ipsos Reid poll (just 5 behind the Tories in both cases, and 13 ahead of the NDP in BC), while nothing of the sort appears in the Harris-Decima survey. Both polls are very bad for the NDP: their regional numbers go from weak in Ontario (16%) and Québec (12%) to very weak in the Atlantic (20-21%) and Alberta (8-9%) to disastrous in MB/SK (14%) and BC (20%) - in the latter, they trail the Tories by 17-18%. Still, the smaller parties are in a strong position. The Liberals are approaching respectability territory, though their inability to get ahead in Ontario means they're not competitive yet with the Tories. The Tory average national lead is down to 4.6%. I have done so in the past, but let me reiterate how important Ontario is for the Liberals to have any chance of defeating the Tories. This is the same seat count for the Tories as in the 2006 election, while the Liberals do 8 seats worse even though they lost by 6% that time. Why? In 2006, the Grits still carried Ontario by almost 5%. Do the Liberals now need to win by that much just to get a seat plurality? My guess is 'not quite so': after all, the "Ontario gap," defined as the difference between the Tory lead nationally and the Tory lead in Ontario, is abnormally low in the latest EKOS poll. That figure stood at 0.4% in the survey, while in my current poll average, it is 3.5%. But even with an Ontario gap of 3.5%, the Liberals would need to win the national popular vote by 3-4% in order to tie the seat count. Now, it is quite possible that due to random error, polls currently understate Liberal gains in Ontario and overstate them elsewhere. If that's the case, and the Ontario gap is roughly at the level of the last election (6%), then the required national popular vote lead for the Grits is even lower. But I'm pretty sure that unless a drastic relative regional change occurs, the Tories would win the seat count in the event of a tied popular vote at the next election. The average Conservative national lead, however, dropped one full point to 5.1%. Note: Once EKOS posts its own report on the poll, I may update the above figures: the CBC report only shows the number of decided voters, and not the total number of voters interviewed. I weigh polls based on the latter because many pollsters report only that. As a result, the current numbers currently slightly underweigh the most recent poll. Update: Weights have been fixed, but that caused no change in the projection. A lot of people think that the Conservatives are getting rid of the mandatory census long form to deliberately produce unreliable data that cannot be used to attack their policies. I don't think the Tories are that devious - they are probably just incompetent with data, and therefore don't appreciate the value of accuracy. - Day did not bother producing any data to back up his assertion that crime is actually increasing in Canada (despite a drop in reported crimes) because more crimes are going unreported to police. - Later, his colleague Rob Nicholson came to the rescue with a complete non sequitur, stating that 34% of crime in Canada go unreported, without mentioning whether the proportion has gone up. - That 34% reported crime figure is down from 37% in the previous report for 1999, which is itself down from 42% in 1993. So the data suggests that indeed, an increasing proportion of crime is going unreported. But the Tory ministers either didn't bother with it, or stated the level of crime reporting both erroneously AND without referring to the time trend, which is required to make their case. You really wonder how these people made it through university. By the way, the next report, covering 2009, is due next month, so we're debating these figures exactly at the time where we have the most outdated data. Are the Tories afraid that the rate of crime reporting has stopped decreasing? Again, my guess is that they were instead simply guided by anecdotal evidence, electoral interest and ideology. Besides, in the 1999 report, StatCan suggests that part of the decrease in crime reporting may be driven by lower damage in property crimes (smaller proportion of $1,000+ cases and bigger proportion below $100) and higher insurance deductibles: many people won't bother reporting a theft if they wouldn't get reimbursed anyway. In fact, reporting of violent crime has increased from 31% to 33% between 1999 and 2004. But, even given supportive data, Conservative ministers are unable to craft a coherent argument for the simple proposition that crime incidence has increased. Is it any surprise that these people don't think much of weakening the census?